I'm learning to not put full reliance on my iOS weather apps when planning for a sunrise! Last night the forecast was a cloudy morning, although further east was due to be clear, so I was unsure on how it would turn out when I got up. Rising early in the morning I found clear skies with clouds on the horizon (the complete opposite!). So on this work day I headed off early with the camera down to the river with Willow again. It was a beautiful still morning, the mist was hanging over the water as well as over one of the neighbouring fields creating a super atmosphere. It was then a case of waiting for the sun to break through the clouds on the horizon. Willow was extremely patient which was encouraging; seeing her slowly mature from an impatient puppy into a more settled 'teenager'! 'Spot the Willow' is the title of my next photo! Having got the photos I wanted from this particular spot it was time to let Willow have some time exploring the riverside. Can you find her? This next photo had some near serious consequences as I waded into the reeds thinking I was standing in shin deep water. That was until after taking the shot I stepped back to find my left boot was firmly stuck in deep mud causing me to lose my balance and nearly ending up flat on my back in the water and mud! Fortunately a bit of nifty right foot work saved the moment (and the camera!). 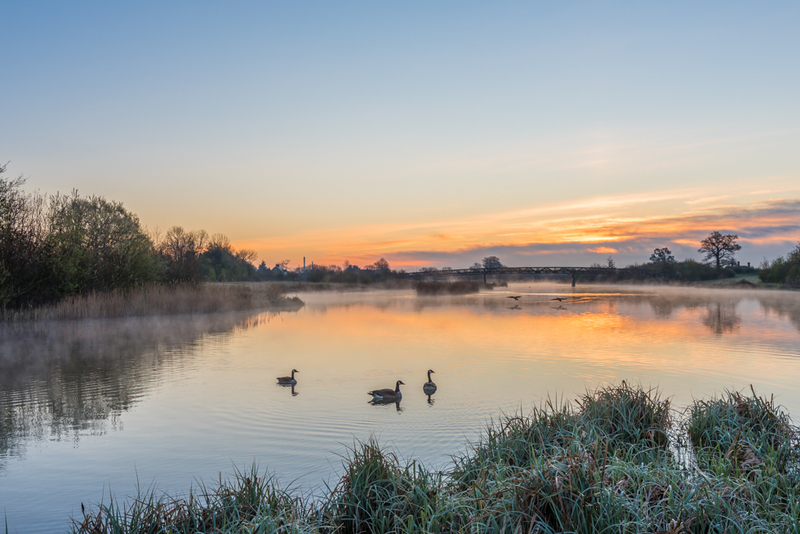 As the sun continued to move higher into the sky the river was clothed in a carpet of rising mist as the temperature slowly increased creating a great atmospheric view back down the river. Just before setting up to take the next photo Willow and I noticed a small group of deer wandering up onto the path ahead of us. They immediately stopped after spotting us, and made a quick exit back into the undergrowth before I could get a decent photo - Willow was taking great interest, her hunting instinct causing her to sit there shaking with excitment! lol. The shot below was the end of the photo session for the morning and time for further exercise for Willow. Walking back later it just struck me what a beautiful start to the day it had been. As well as a Kingfisher flying past earlier in the walk, I saw and heard a Chiffchaff singing away, and also what I think was a Garden Warbler ... Spring was in the air!